Nothing polarises Apple Fanboys more than the Apple versus Microsoft argument. For so long marginalised as the pitied minority platform, users of Apple hardware and software defended their honour by slavishly worshipping the company and demonising its arch nemesis Microsoft. While many hold similar views, it is the rabid anti-PC warrior who is most worthy of the title Apple Fanboy. I like Apple products, admire the company and its haloed leader Steve Jobs, and have distrust of Microsoft borne from its years of anti-trust lawsuits, ruthlessly monopolistic business strategies and shameless copying of the Mac OS – but I’d hate to be labelled an Apple Fanboy. You have to revel in the sobriquet to be a real Apple Fanboy and an undying love of the company must be foremost in one’s mind at all times. An Apple Fanboy tries to dress like his hero/god Steve Jobs (blue jeans, black turtleneck, sneakers) or otherwise wear Apple-branded T-shirts, badges or tattoos with anti-Microsoft barbs, such as “Windows 95 = Macintosh 89”. He – and most are male – might fly a pirate flag over his house (which he’ll likely live in alone or with his mother and his collection of old Apple computers), or have the Apple logo shaved onto the back of his head. Don’t get into an argument with an Apple Fanboy. He won’t back down and he’ll probably be right about 75 per cent of the time. Feiss, Ellen Every Apple Fanboy knows that there’s only one person who matters at Apple and that’s Steve Jobs. Sure, there are others we can name – like Jobs-controlled design puppet Jonathan Ive and Steve’s comedy sidekick Phil Schiller – but for Apple to retain its unique brand it shouldn’t dilute it with more fallible humans. Aside from the legends depicted in the Think Different ads – and a brief, disconcerting fixation with Jeff Goldblum – people with real names are kept out of Apple adverts. Actors can play the Cool Mac Guy or Windows PC Fool. iPod dancers are shown in silhouette. But Apple did name non-Jobs humans for a brief period at the start of the millennium, in its Switch campaign. One of the people telling the world why she switched from a lousy Windows PC to super-duper Mac was 14-year-old American high-school student Ellen Feiss. Feiss slurred her way through the commercial (“my PC went beep, beep, beep, bleep, beep, bleep, beep”) looking like a heavy-eyed stoner, which nicely tied in with Apple’s old counter-culture image. As soon as the ad aired Feiss became an internet phenomenon, courted by late-night US TV chat shows. The ad has been viewed millions of times on YouTube (very possibly unsavourably by those live-alone Apple Fanboys), and marks the start of the resurrection of Mac cool among the youth of America. Films Apple likes to be cool and tries very successfully to get its products into movies and popular TV shows, such as The X-Files, The O.C., 24 and Spooks. Apple actually saved the world from alien destruction in 1996 movie Independence Day, with Jeff Goldblum (again!) using his PowerBook G4 to infect a spaceship with a virus – don’t ask how a Mac managed to get a virus, this was sci-fi after all. Apple is rather less grandly referred to as “some kind of fruit company” in the Oscar-winning Tom Hanks movie Forrest Gump. There’s even a 1999 movie about Steve Jobs and Bill Gates called Pirates Of Silicon Valley – based on the book Fire in the Valley: The Making of The Personal Computer by Paul Freiberger and Michael Swaine. Medical soap ER heartthrob Noah Wyle played Jobs, and while you’d have expected Apple’s legal team to swoop and squash the film’s distribution Steve saw the funny side and even had Wyle impersonate him on stage during his New York Macworld Expo keynote that year. Final Cut Final Cut was an average British thriller with Ray Winstone and Jude Law, and another forgotten film with that guy who was funny in Mork & Mindy. But Apple’s Final Cut makes movies rather than stars in them. 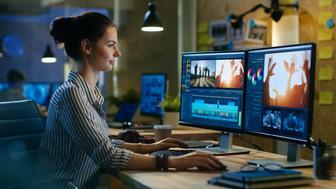 Peeved that Adobe was spending more time developing its Premiere video editing software for Windows rather than the Mac, Apple purchased Macromedia’s KeyGrip editor and launched its own high-end video editing solution in 1999. It quickly became an industry standard, and this time it was Adobe that was pissed off – junking the Mac Premiere version altogether in 2003 before crawling back in 2007. Finder You would expect something called the Finder to be a search tool, but it’s actually the Mac’s desktop-style file manager – the default opening program in the Mac OS since the very beginning. Bud Tribble named the Mac’s manager the Finder, as it was more visual than Apple’s pre-Mac Lisa’s Filer file manager. The Finder is like the Adam and Eve of the graphical user interface, where the desktop metaphor took shape and enabled the icon-based operating system to flourish into what we have now – and, unlike most elements of the ancient 1984 Mac OS, retains its curious name even today.